Which Big Brands Have the Most Twitter Followers in Common? Which marketers tend to attract the same Twitter followers? To find out, Simply Measured recently analyzed the 100,000 newest followers of the social network's 10 most-followed global brands. Here is a somewhat noteworthy discovery: Starbucks shares an overlap of 16 percent of followers with fashion retailer H&M. Kevin Shively, senior strategist at Simply Measured, called the commonality "surprising." And if you scroll down to see the chart below, you'll see that such shared audiences among top brands is less frequent than one might guess. "A big reason for this overlap is how closely their customers mirror one another," Shively said of Starbucks and H&M. "Around 40 percent of Starbucks' sales come from adults aged 18 to 24. This is their fastest-growing segment. This same demo group accounts for almost 30 percent of the traffic to H&M's website." On the other hand, Peter Friedman, CEO of LiveWorld, wasn't surprised by the social cross-over between the brands. "Starbucks in particular, given its market ubiquity, is likely to have overlaps with many brands," he said. Friedman added, "You can [glean] interesting psychographic information about your customers based upon who they follow and what they talk about across social channels. I find brands are often surprised by customer conversations in social media and how people talk about their category." When a user joins Twitter, the platform recommends 40 accounts to follow based on the person's digitally shown interests. Seattle-based Simply Measured learned that users only add another three or four brand accounts after the initial 40, suggesting that the ability to appear on this "suggested" list is pretty important for marketers. People who follow marketers are evidently a key segment of Twitter's "monthly actives." Sixty-eight percent of users following the 10 biggest brands have tweeted at least one time every 30 days during their time on the social site. One might actually expect this stat to be higher: 26 percent of Burberry's followers also follow Louis Vuitton. Every Twitter user has his or her marketing limits. Less than 1 percent of users follow four or more of the brands, and only 14 percent followed more than one. Most Twitter users follow 50 or fewer total accounts, according to Simply Measured. 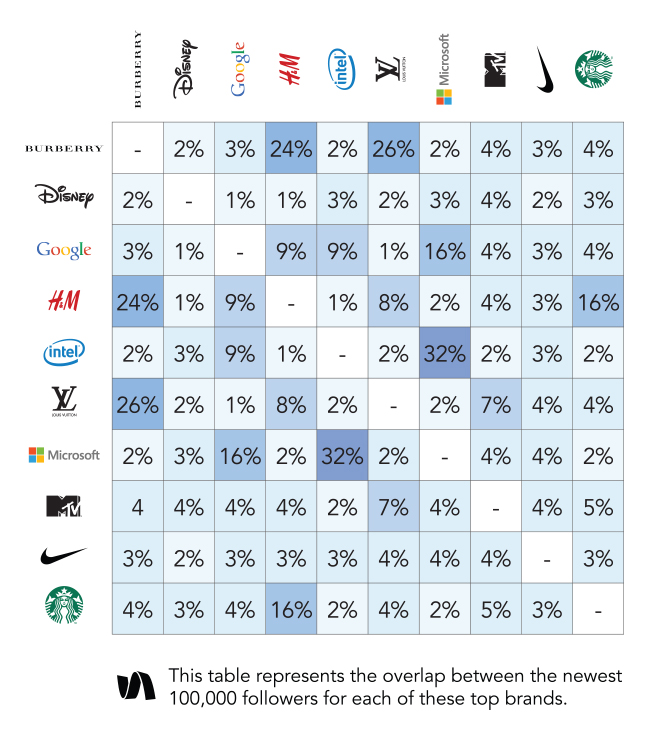 Check out the rest of the brand-overlap stats in the chart below.